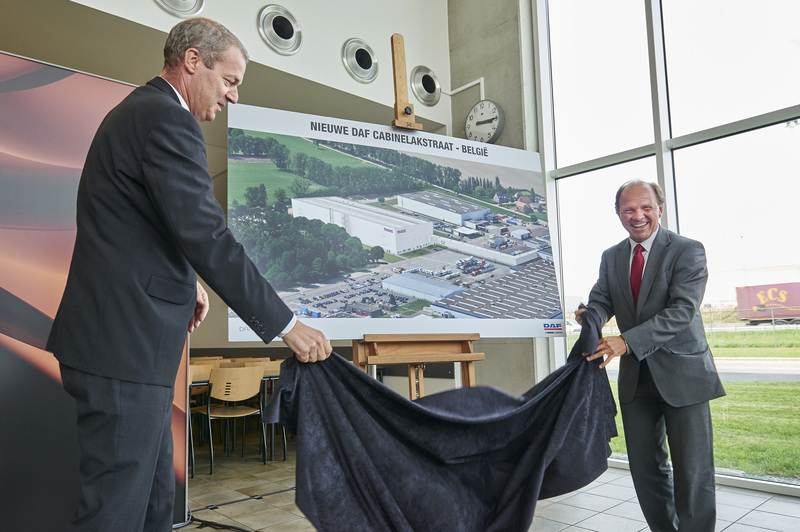 DAF invests EUR 100 million in new Westerlo paint shop - DAF Trucks N.V.
DAF is to invest EUR 100 million in a completely new state-of-the-artpaint shop for its cab factory in Westerlo, Belgium. Upon completion it will bethe most modern truck-cab paint shop in the world. The Dutch truck manufacturermade the announcement today during a visit by Philippe Muyters, the FlemishMinister for Work, Economics, Innovation and Sport. The first cabs will leavethe new 25,000 m2 large paint shop in the first half of 2017. DAF opened its Westerlo factory in 1966, where - in addition to cabs - it has also produced its own axles since the early seventies. The current workforce of 2,150 employees produces around 500 axles and 200 cabs per day for the heavy and medium duty trucks that come off the production lines in Eindhoven and in Leyland (UK). In the coming years DAF expects demand for trucks in Europe to grow and aims to expand its market share in the heavy-truck class to 20%. In addition, DAF also wants to expand its success outside Europe. To achieve this ambition for the coming years, DAF is creating a completely new cab paint shop at the DAF Trucks Vlaanderen site. Thanks to this investment, the production capacity of the cab plant increases with some fifty percent. The new paint shop is 144 meters long, 58 meters wide and 26 meters high, and covers three floors. It is the most modern of its kind in the world, also thanks to the partners Eisenmann and Dürr, both leaders in the field of automotive paint shops. Eisenmann delivers the paint-spraying installations (spray booths, ovens and transport systems) and Dürr is responsible for the paint equipment. Amongst others, ultra-modern paint robots will be used with so-called ‘bells’. These rotate at speeds of up to 50,000 revs/min for the highest quality and maximum efficiency with reduced paint and solvent consumption. Next to quality and efficiency, the lowest impact on the environment has been a major focus point in the design of DAF's new cab paint shop. Many innovative solutions have been applied, including a special method to reduce and catch the inevitable ‘overspray’ when painting. Ultra-modern paint robots will very closely follow the contours of the cab, which means less paint is required. DAF is also investing in the latest technologies to clean the air leaving the spray booths and ovens. The air is condensed so that it contains a relatively large amount of solvents, which burns automatically at a temperature of 700 to 800 degrees without the need for gas to be added and produces enough energy to heat the processing baths. The new solution not only means lower energy consumption. In addition to very limited amount of CO2 emissions, only clean water vapor is emitted. "DAF is a classic example of how successful the manufacturing industry in Western Europe and more specifically in Flanders can be," says Flemish minister Philippe Muyters. "That can be done by continuously investing in further increasing the quality and productivity and - just as important - in innovation. As the government, it is our duty to create an excellent climate for this and we are therefore giving this investment our full support. The new DAF cab paint shop, is a high-tech facility with numerous advanced technologies, particularly in the area of environmental protection. I am proud that Europe's most modern paint shop for truck cabs will be in Flanders."